JNN 17 Apr 2013 Damascus : Syrian government troops have broken through a six-month rebel blockade in northern Syria and are now fighting to recapture a vital highway, opposition and state media said on Monday. Rebels had kept the army bottled up in the Wadi al-Deif and Hamidiya military bases in Idlib province. But on Sunday, President Bashar al-Assad’s forces outflanked the rebels and broke through, the pro-government al-Baath newspaper said, Reuters reported. The insurgents counter-attacked on Monday but their front has been weakened in recent weeks due to infighting and the deployment of forces to other battles, activists said. The break-out from the bases, located outside Maarat al-Nuaman town, may enable the army to recapture the main route into Aleppo, Syria’s largest city, and bolster their fragile supply lines in the heart of the rebel-held north. 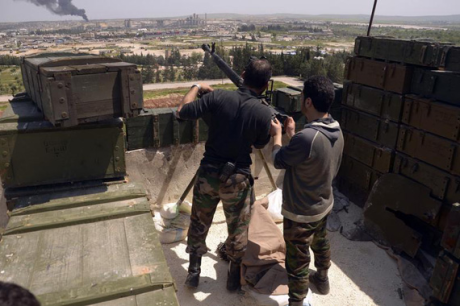 Rebels had advanced in northern Syria, near Turkey, and southern Deraa province near Jordan. But government forces have kept the rebels out of central Damascus and hold more than half of Homs city. Rebel attacks had forced the army to relinquish many bases in northern Syria and most roads around Aleppo and Idlib province, leaving the remaining government-controlled areas in the north to rely on airlifts for food and weapons. “The break of the blockade yesterday allowed the army to drive six lorries full of weapons to get into the bases of Wadi Deif and Hamidiya,” Rami Abdelrahman, head of the British-based Syrian Observatory for Human Rights, told Reuters. The pro-opposition observatory said that despite the army gains, neither side had a clear advantage. Abdelrahman counted more than 50 fighters dead or missing from the battle on Sunday. The army advance was not yet a decisive victory but could reopen battlefields in the north where rebels had the advantage, he said. According to the official SANA news agency, Syrian government forces launched attacks against militants in the Damascus suburbs of al-Nabek, al-Sbaineh, and Nabil al-Utmeh on Sunday and killed a large number of them. In the town of Daraya, near Damascus, an army unit carried out a special operation against “a terrorist gathering” southeast of the shrine of Sayeda Sakina in which eight “terrorists” were killed. Syrian government forces also launched attacks against militants in the governorates of Idlib, Homs, Deir ez-Zor, Latakia, Aleppo on Sunday and killed a large number of them. In addition, the Syrian armed forces captured many machine guns, sniper rifles, rocket launchers, hand-made rockets, mortar shells, and anti-tank missiles. The Syria crisis began in March 2011, and many people, including large numbers of soldiers and security personnel, have been killed in the violence. “If the unrest in Syria leads to the partitioning of the country, or if the terrorist forces take control… the situation will inevitably spill over into neighboring countries and create a domino effect throughout the Middle East and beyond,” he added. This entry was posted in Middle East and tagged Aleppo, Bashar al-Assad, Hamidiya, Idlib, Middle East, Sunday, Syria, Syrian government. Bookmark the permalink. This Should be the beginning of the end of the Yahoodi Arabian Wahabi Salafi interference and the Terrorist activities against the SYRIAN NATIONS solidarity and integrity . Zindabaad Asad Al Bashar payendabaad . La’anat Allah bar Zalemeen wa Munafeqeen .